Made from cork, these place card holders are the perfect dinner party accessory for wine lovers. 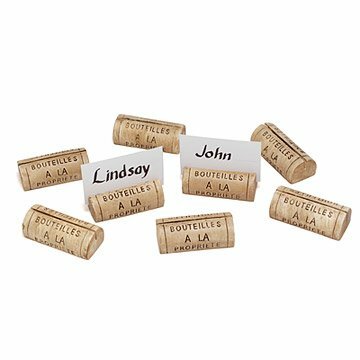 Put a cork in seating arrangement chaos with these clever wine cork place card holders. Looking every bit like the real thing, the resin corks feature a discreet card slot and a flat base to stay put long after the last bottle of wine is finished. The set of eight pieces keeps even your largest dinner party in their seats, and it makes the perfect gift for wine enthusiasts and harried hostesses. Made in China. Sold as a set of 8.
my sister entertains regularly and is a wine connoisseur. She loves the gift! I gave this to a friend at work who is impossible to buy for. He and his wife loved them. For the price, i was expecting something much cheaper-feeling but turns out these are quite solid and feel very high quality. They even came with their own sets of place cards so you don't have to make your own. All in all, great, cute product and made a great gift - and the price is right. The slot is not tilted quite enough which makes it harder to read the card without bending down. Overall though, a really cute and unique way to label appetizers, especially at a wine and cheese party! I was happy to find this site. I like the fact that they were shipped so quickly and the product was made of high-quality material. The place card holders made a perfect addition to my holiday gathering. I would buy this as a hostess gift! They are really nice! Good quality! These are not made out of cork as I thought but that's my mistake for not reading the product description thoroughly. However, they are sturdy and reusable for other events. The card holders were great. The quality is excellent, and the gift recipient loved them.